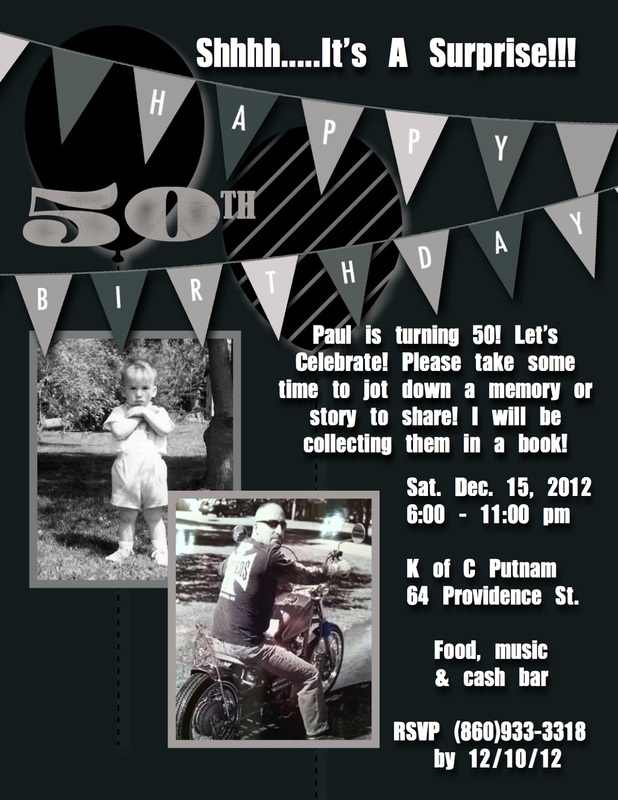 Yesterday marked the 50th year of my dear husband Paul’s birth! While we didn’t actually celebrate in full style yesterday, have no fear because I planned a huge surprise party that was held earlier this month! I did this so that he wouldn’t expect it! lol I created the invitation using MDS 2 and couldn’t resist sharing it with you all! Believe it or not, I managed to keep the party a total surprise! So much so I have to share a comment that Paul made when he arrived at his own party. We managed to get him to open the door to the room where everyone was hiding and they all yelled, “Surprise!” he immediately slammed the door shut and said to us, “Holy crap…I just crashed someones party!” I couldn’t help but laugh hysterically and we had to get him to open the door again! Here are a few photos from his half century bash! A special thank you to Brielle and Dawn R. from NJ for their special gift of Harley Davidson plates and napkins! They were used to serve all of the birthday cake to the 80+ guests of the party! Here is the “old” guy with our beautiful daughter Katelyn! Special thanks to Katelyn as well! She helped me to plan, set up, and run the whole party! Love you guys! I will be sharing the most beautiful birthday card ever! It was send to Paul by our special friends the Griffith family from MI!!! Keep your eyes peeled for this one!